According to the Black Ops 3 status page, every platform is on Defcon 5, which means everything is working as normal. Carry on and frag the night away. While yesterday and even today’s PlayStation Network outages seem to be sorted out, it looks like Call of Duty is the latest one to get hit with some unexpected downtime. 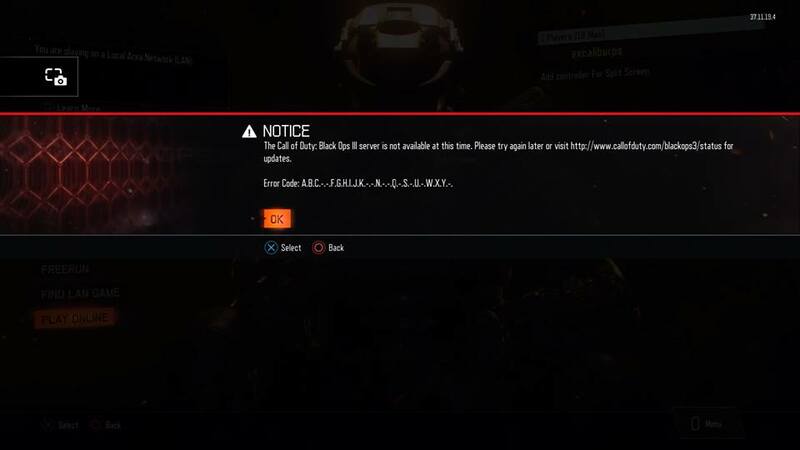 As of press time, Call of Duty: Black Ops 3 multiplayer is unavailable or experiencing issues for every platform it’s on. Yep, it’s not just the PS4, but even the Xbox and PC platforms are affected. Over on the official Black Ops 3 status page, every platform is on “Defcon 3,” which states, “ONLINE SERVICES ARE DEGRADED. USERS IN SOME REGIONS MAY EXPERIENCE CONNECTIVITY ISSUES.” Oddly enough, while the PS4 servers are on Defcon 5, the status page lists it as “all online services are fully operational,” which, unless my PS4 is lying to me, is a complete fallacy since I’ve yet to connect to the game after numerous attempts. The Black Ops 3 subreddit acknowledges the Black Ops 3 servers down time with a thread, too. We’ve yet to hear anything official from Activision, but we’ll be sure to update the post once we do, and of course, once there’s anything new to report. While some of you might have been hoping for some post-Thanksgiving Call of Duty: Black Ops 3 multiplayer binge session, that will have to wait. Let’s hope it gets resolved soon and fast.